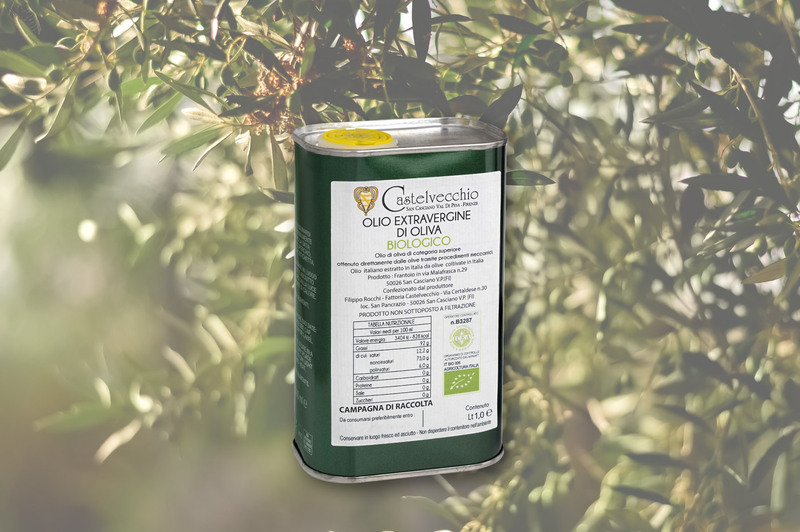 The extra virgin olive oil of Castelvecchio is obtained from specialized olive groves situated on the hills of San Casciano Val di Pesa (20 km from Florence) at an altitude of 250 mt (south-eastern exposure). Our oil is still produced using traditional methods in which the olives of different varieties : Moraiolo, Frantoio, Leccino and Correggiolo are gathered by hand and taken to the oil-mill within 24 hours. This is the only procedure which ensures a decidedly special oil with an unmistakable flavour. Our oil has not been filtered , hence eventual deposits are due to its natural decantation. We recommend to store the product in a cool place, don’t expose it to any source of light or heat. Superficies olive groves : 14 Ha / olive trees: 3500. Our extra vergin olive oil is sold as follow: Bottles : 250 ml and 750 ml with pouring spout Cans : 1 liter and 5 liters. It concerns oil that is obtained from olives exclusively through a mechanical process or a physical process that doesn’t implicate alterations of the oil and hasn’t undergone any treatment different from the washing, the clearing, the centrifugation and the filtration.